I've always struggled to with the best way to implement it. I found a related thread on StackOverflow that has more than 250,000 views, so obviously I'm not the only one wondering! I'll sum up my latest thoughts in this article. Before we dive into it, let's first examine the difference between the "wrapper" and the "container". I believe there is a difference between wrapper and container elements. In programming languages, the word container is generally used for structures that can contain more than one element. A wrapper, on the other hand, is something that wraps around a single object to provide more functionality and interface to it. So, in my opinion, it makes sense to have two different names because they intend different functions. Speaking of the wrapper, it's common to think of a <div> that contains all the rest of the HTML of the document. 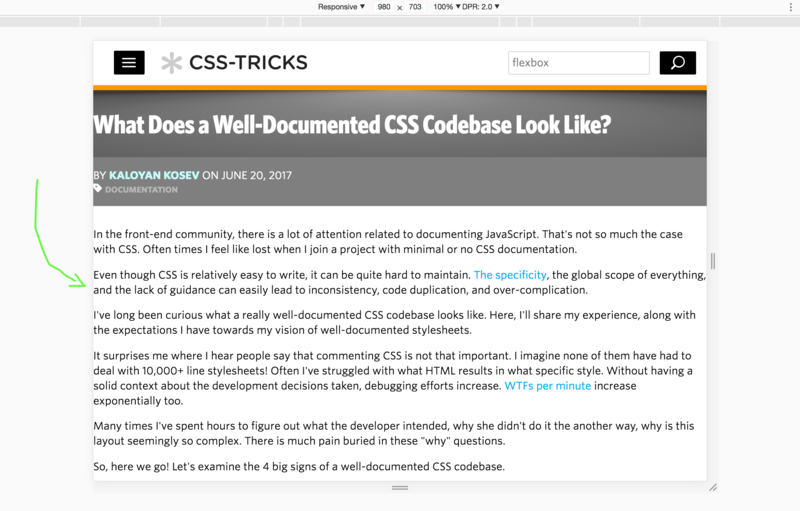 I'm sure many of us have lived through a time where we set that to 960px in width and center aligned all our main content. Wrappers are also used for things like applying a sticky footer. The container, on the other hand, usually intends another kind of containment. One that sometimes necessary to implement a behavior or styling of multiple components. It serves the purpose of grouping elements both semantically and visually. As an example, Bootstrap has "container classes" that house their grid system or contain various other components. The terms wrapper and container can also mean the same thing depending on the developer and what they intend. There might be other conventions too, so the best advice is usually to implement whatever makes the most sense to you. But remember, naming is one of the most fundamental and important parts of developer activities. Naming conventions make our code more readable and predictable. Choose carefully! * 1. Centers the content. Yes, it's a bit opinionated. Setting the width of a block-level element will prevent it from stretching out to the edges of its container (good for things like readable line lengths). Therefore, the wrapper element will take up the specified width. The problem occurs when the browser window is narrower than the specific width of the wrapper. That will trigger a horizontal scrollbar, which is almost always undesirable. Using max-width instead, in this situation, is better for narrower browser windows. This is important when making a site usable on small devices. Here's a good example showcasing the problem. See the Pen CSS-Tricks: The Best Way to Implement a CSS Wrapper by Kaloyan Kosev (@superKalo) on CodePen. In terms of responsiveness, max-width is the better choice! I've seen a lot of developers forget one particular edge case. Let's say we have a wrapper with max-width set to 980px. The edge case appears when the user's device screen width is exactly 980px. The content then will exactly glue to the edges of the screen with no breathing room left. The "no breathing room left" problem. Therefore, that's why adding padding-left and padding-right to your wrapper might be a good idea, especially on mobile. Or, consider using box-sizing so that the padding doesn't change the overall width at all. A wrapper has no semantic meaning. It simply holds all visual elements and content on the page. It's just a generic container. In terms of semantics, <div> is the best choice. The <div> also has no semantic meaning and it just a generic container. The <section> element is not a generic container element. When an element is needed only for styling purposes or as a convenience for scripting, authors are encouraged to use the div element instead. A general rule is that the section element is appropriate only if the element's contents would be listed explicitly in the document's outline. The <section> element carries it's own semantics. It represents a thematic grouping of content. The theme of each section should be identified, typically by including a heading (h1-h6 element) as a child of the section element. It might not seem very obvious at first sight, but yes! The plain ol' <div> fits best for a wrapper! And it will result in one less element in your markup because you can drop that unnecessary wrapper <div> this way. You need to enforce a footer to "stick" to the end of the document (bottom of the viewport when the document is short). Even if you can use the most modern way to do it - with flexbox, you need an additional wrapper <div>. You need to set the background-color of the whole page. Normally, whatever background you set on the <body> will behave as if it was set on the <html> element should it not already have a background. Just a weird thing in CSS. But if your <html> element does already have a background, and you set the body to something else, and the body has any kind of spacing constraint, backgrounds will get weird. It's a tricky thing. I would conclude it is still best practice to have an additional <div> for implementing a CSS wrapper. This way if spec requirements change later on you don't have to add the wrapper later and deal with moving the styles around. After all, we're only talking about one extra DOM element. I have always set the background on <html> and wondered why it’s not more common. A while ago I wrote this SCSS mixin for one of my projects and I’ve just been using it ever since to make handling wrappers pretty simple. Is that case use of the main element would be better to show that the content of the wrapper is the important part of the page with useful information and everything outside of it is just generic UI. Same here. I would recommend to use this setup in HTML files too, because you can easily style fullwidth-parts of your design and don’t need to care about the inner dimensions if they’re once set. Hello, nice overview. How about the use of the tag from the wrapper ? And it will result in one less element in your markup because you can drop that unnecessary wrapper div this way.